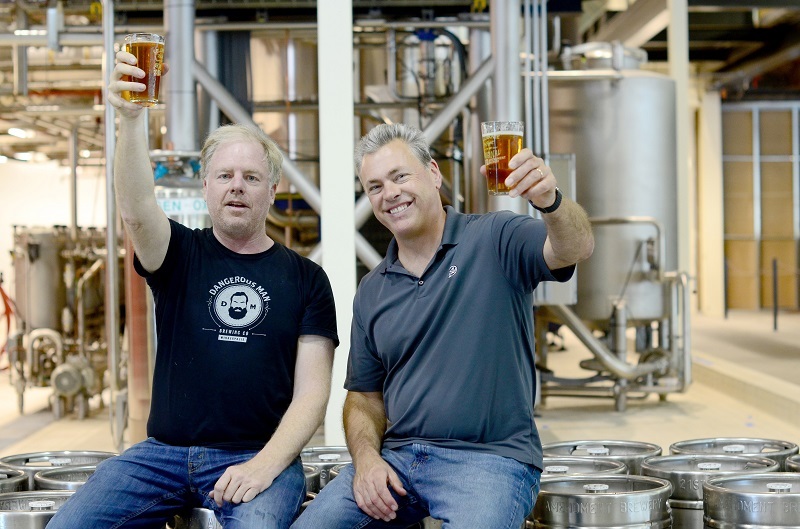 Fifteen years after founding 21st Amendment Brewery in San Francisco and seven years after they started brewing under contract in Cold Spring, Minnesota, Nico Freccia and Shaun O’Sullivan opened a production brewery this June in San Leandro, California. The 150,000-square-foot facility—where Kellogg’s formerly produced Pop-Tarts, Frosted Flakes and Eggo waffles—is now home to a 100-barrel brew house and tasting room, and a restaurant and beer garden are in the works. All About Beer: What attracted you to San Leandro? Nico Freccia: Shaun and I both live in the East Bay, and we were looking in the corridor between Berkeley down to San Leandro. In order to do something of this size, you need the water, you need the power, you need the sewer, and if you don’t have those things, you’re spending a few million dollars in infrastructure before you start. Because this was a manufacturing facility, it had all the bones we needed. You have some great beer neighbors. Cleophus Quealy Beer Co. opened in 2014, and you mentioned that you can throw a baseball and hit Drake’s Brewing Co.
Shaun O’Sullivan: Yeah, we do that daily (laughs). The great irony about being in San Leandro is that my first brewing job was at Triple Rock Brewery, which is owned by John Martin, who owns Drake’s. He gave me my first job and then I opened up a larger brewery next to his. There’s probably a Star Wars analogy there with Darth Vader and Luke Skywalker and Obi Wan. Overnight we’ve created a brewing cluster here, and there’s really an opportunity to have some fun. Are you nervous about opening a production brewery during a drought? SO: Of course, but with building a system of this scale and the technology around it, we are actually very efficient with how we handle water … squeezing every last bit of wort out of the system. We’re not rinsing cans with water. There are massive amounts of water used any time you bottle anything. You have to rinse them out, sanitize them. We don’t have to do that. The cans arrive sterile. We have an air ionizer that blasts them out and creates an environment for things not to grow in there and then they’re filled immediately. NF: And we have another brewery. We don’t have to rely 100 percent on water and beer coming out of this facility. How much will you rely on production in Minnesota? NF: By the end of the year we’ll be able to make all of our core beers out of both locations. This plant will feed the West Coast, and Minnesota will feed the East Coast. This will be the place where all of our Insurrection beers, specialty beers and seasonals will come out of. So you can be more creative here? SO: Here it’s an opportunity to stretch our wings and have a lot more fun. We can make variety packs, which are huge right now in craft beer. We’re coming out with a new package size that we’ve never done before, and new and innovative beers (like Toaster Pastry) that we haven’t done before. Is the San Francisco brewpub still your primary test kitchen? SO: That’s where a lot of our beers originate. They also originate in my house. I’ve done several homebrews of a lot of beers that started there and then go to the pub as a 12-barrel batch and end up on a larger system. The next phase of construction here includes a restaurant and several bars. Why not just one tasting room? NF: The idea is to have these floating spaces that are a process of discovery. You’re in a space that mixes landscape and light with industry and all these little buildings within buildings. It’s really about making this kind of a place to go, spend time, discover a lot of fun things. In the long run, what else is in store? SO: We’ve talked about a sour program, about distilling. We’ve talked about micro-malting. That’s going to become pretty hot here pretty soon, and we have a lot of space back there to do that. NF: First and foremost it’s about our production and having (additional space in) the back allows us to expand and probably double the size of this existing facility. But we’ve got a rail spur in the back that Kellogg’s used to bring grains in. It comes right into our building. We’ve thought it would be cool to find an old 1920s or ’30s railcar, park it out there. Then build a little landscaped path from the tasting room here down to the entrance to what we call the rail bar. And maybe the back becomes a music venue and we have a little amphitheater. Do you get goose bumps walking around this brewery? NF: Every day. But the best thing still is that moment when you can walk between the conveyors on the packaging line, pull a can of ice-cold beer right out of the filler, crack it and drink it right there, and it’s perfect. SO: When we opened up the tasting room, the whole community came out. We had old-timers that used to work here at the Kellogg’s plant coming up and telling me their stories. That’s a real humbling experience to feel like you’re the custodian of this space. That’s really cool. The fact that they used to make food here—and I think beer is a food—so we’re essentially making food here again. This interview was conducted and edited by Jon Page. Go to the next page to learn more about Nico Freccia and Shaun O’Sullivan. What sort of Irishman spells his name Shaun ?